If you’d like to earn Multiple Streams of Property Income in the shortest possible (yet realistic) timeframe, and if you’d like to earn recurring, passive income from all four income “Quarters”, and if you’d like to set up simple systems to “set and forget” each income stream to allow them to compound year on year, then this book is for you. If you want unrealistic get rich super-quick, or you want to work yourself to the bone for the next 50 years, then this book is not for you. 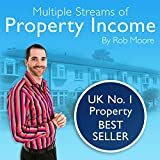 Rob Moore, a former struggling artist has authored three best-selling property books, has bought and sold over 350 properties in the last decade and co-founded the Multi-million Progressive group, all in his 20s/early 30s. For the first time he reveals to you the property investing world from the inside, shares multiple income strategies, scams and his roller coaster journey, including costly mistakes, so you can save and make more leveraged income in less time. Discover the secrets used by successful real estate investors to create happiness in their lives and businesses. Naturally create more happiness for yourself by implementing time-tested secrets to happiness used by other real estate professional and investors just like you. Start to experience more productivity, satisfaction, and success immediately. Over the past 3 years I have been asking the question, What makes people really happy while real estate investing? This book contains these answered secrets. Each real estate secret is researched and discussed in easy-to-understand language to help you immediately understand and implement more happiness in your life. Discover more productive time every day. Automate your real estate selling funnel. Expand your local circle of influence. Don’t be fooled with quick fixes and guilty pleasures giving you a dopamine high and quick crash. This book focuses on building happiness through new daily habits, fun investing strategies, stronger relationships, a healthier lifestyle, and a more productive real estate investing business. No matter the niche of real estate that excites you this book is for you: Flipping real estate, wholesaling real estate, notes, condos, real estate options, rentals, commercial property, residential real estate, foreclosures, multi-family real estate, REOs, fix and flips, short sales, mobile homes, Realtors, brokers, and all other real estate professionals looking to increase results and more happiness. It is my personal opinion that real estate investors need a reminder that real estate investing is not only a source of profit and fortunes, real estate investing should be a source of joy, creativity, freedom, self- expression, and accomplishment. There is a need for more HAPPINESS and VALUES in this business. Do not let another mediocre day pass you by. Make the most of everyday investing by implementing new business-building habits that can catapult your happiness to new levels. On every page you will find a new secret, a clear description of this secret, your challenge to begin taking action, and any additional websites that pertain to this secret. Don’t forget to take a look inside with Amazon’s Look Inside feature above. Check out the first few pages and see some of the secrets inside. Scroll up, click the buy button & get started today!